UV Systems is a pressure driven membrane separation process that separates particulate matter from soluble components in the carrier fluid (such as water). UV Systems has larger pores than nanofiltration and reverse osmosis. UV Systems is a low-pressure membrane process used to separate high molecular weight compounds from a feed stream. Typically, UV Systems will remove high molecular-weight substances, colloidal materials, organic and inorganic polymeric molecules Low molecular-weight organics and ions such as sodium, calcium, magnesium chloride, and sulfate are not removed. Because only high-molecular weight species are removed, the osmotic pressure differential across the membrane surface is negligible. We are the leading and prominent Manufacturer and Exporter of Ultraviolet Unit. 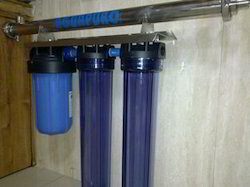 Aguapuro offers Domestic & Commercial UV Water Treatment Systems with wide range of flow rates and applications, we offer high quality domestic & commercial UV Water Treatment systems from 500 lts per hour up to 5000 lts per hour flow rate bigger systems are available in custom made designs and offered as a separate units. 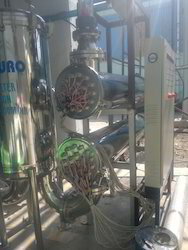 These systems are complete with micron bag filter followed by cartridge filter to remove dirt, silt, suspended impurities followed by activated carbon filters for removal of organic impurities with end point treatment of ultraviolet sterilization of water to eliminate waterborne bacteria to produce healthy and pure & safe water for drinking / potable use. We offer high quality Industrial UV Systems. Our UV systems are used throughout a wide range of water treatment applications, including industrial process water, potable water, industrial and municipal Water treatment. These systems are provided with UV Lamps of 39 or 65 Watts with Quartz Jacket (TUBE) to avoid water contact with UV Lamp. 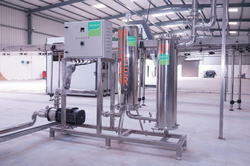 Systems are provided for any Flow rate upto 500 M3/hr and more with combination of Units. UV Lamps specially manufactured in Quartz Tube by AGUAPURO having intensity more than 60000 micro watts Sec/cm2. 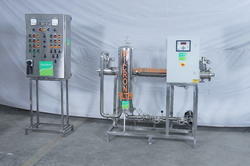 Systems are Provided with Hour Meter and optional UV Intensity meter. Our UV systems UV Water Treatment System are used throughout a wide range of water treatment applications, including industrial process water, potable water, industrial and municipal Water treatment. Looking for UV Systems ?